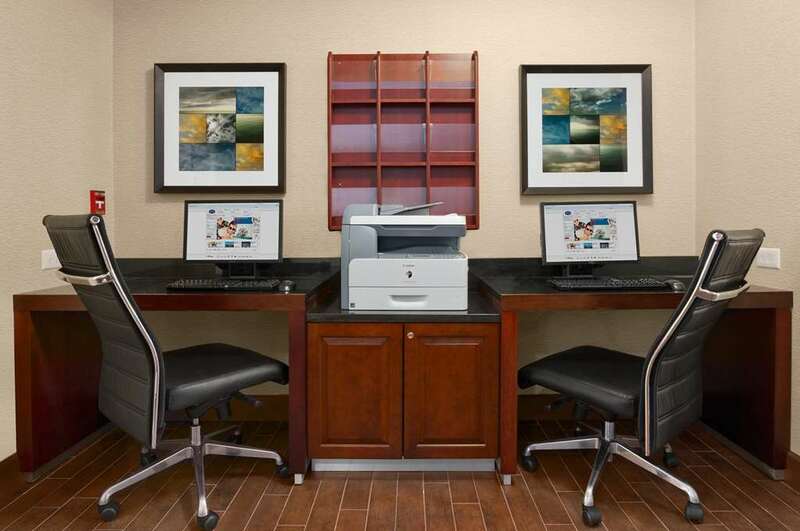 The Hampton Inn Lexington Park is the ideal property for all travelers no matter what brings you to the Lexington Park MD area. We are located directly across from Gate 1 of the Patuxent River Naval Air Station and the Patuxent Naval Air Museum. Our hotel offers easy access to shopping dining and recreation activities. such as Historic St. Mary*s City Sotterly Plantation Point Lookout State Park and Lighthouse as well as fishing boating kayaking and golf. Relax in your spacious guest room or suite at Hampton Inn - Suites in Lexington Park MD a 111-room hotel. Every comfortable guest room includes a clean and fresh Hampton bed a 32-inch flat-screen TV and a large work desk. Prop your laptop on the portable lap-desk and sit back in the comfortable easy chair. Use the refrigerator and microwave to cook meals whenever it suits you or enjoy a snack from our Sweet Shop. If you*re looking for a little extra room try a spacious deluxe room with a full-sized sleeper-sofa or upgrade to a suite. Our King Office room features a private office area attached to the main room. For special occasions choose our Queen Bed Suite with a 42-inch LCD TV and kitchen area. Whether you*re here for business or are enjoying a family vacation you*ll get free WiFi free access to our beautiful outdoor pool and new 24-hour state of the art fitness center and Hampton*s free hot breakfast buffet with our special signature waffle bar and oatmeal. Grab a cup of coffee from our 24-hour coffee and tea bar before taking on the day or for an afternoon pick up. Even if you*re in a rush simply grab one of our free Hampton On the Run Breakfast Bags available Monday through Friday for a quick healthy meal to go. As a pet friendly hotel with no pet fees we love to pamper our four-footed guests as much as our two-legged ones. Plus we offer all of the usual Hampton amenities such as Hilton HHonors rewards points and our famous 100 Satisfaction Guarantee. Asahi Japenese Bar and Grill: Asahi is located in San Souci Plaza which is north of the hotel on Rt. 235. Entertainment and good food all in one if you sit at the grill. IHOP: Although IHOP restaurants are best known for their award-winning pancakes omelettes and other breakfast specialties IHOP restaurants are open throughout the day and evening hours and offer a broad array of lunch dinner and snack items as well.